Ralph Scott of Canyon Country votes in the Los Angeles County primary election at Canyon Springs School's library on Tuesday evening, June 3 in Santa Clarita. 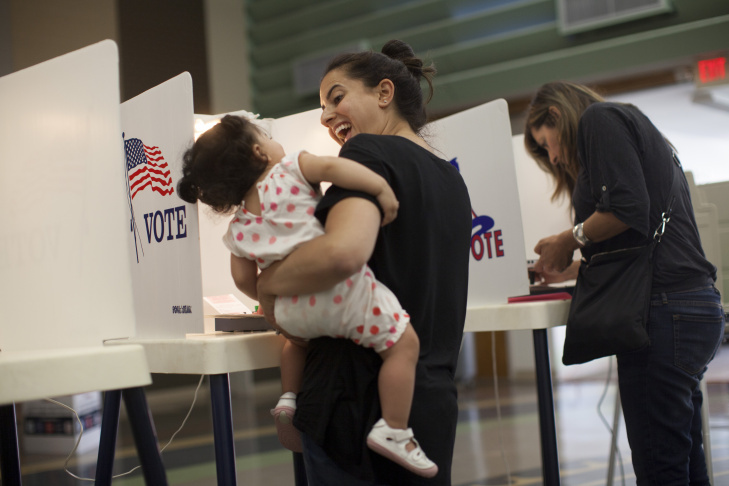 Miriam Ironi shares a laugh with her daughter while casting her vote at First Methodist Church in Santa Monica. Poll clerk Manny Romero, right, helps translate for a Spanish-speaking voter at Canyon Springs School's library on Tuesday evening, June 3 in Santa Clarita during Los Angeles County's primary election. Evelyn Cederbaum and her husband, Stephen, right, cast their votes during the primary election at the Montana Branch Library in Santa Monica. 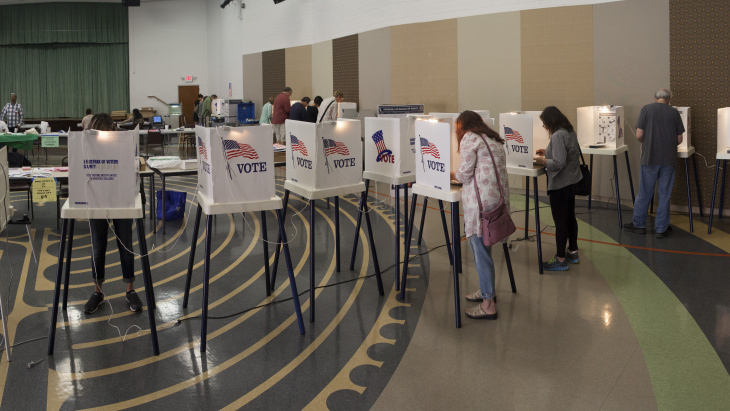 Voters head to the polls for Los Angeles County's primary election at Canyon Springs School's library on Tuesday evening, June 3 in Santa Clarita. 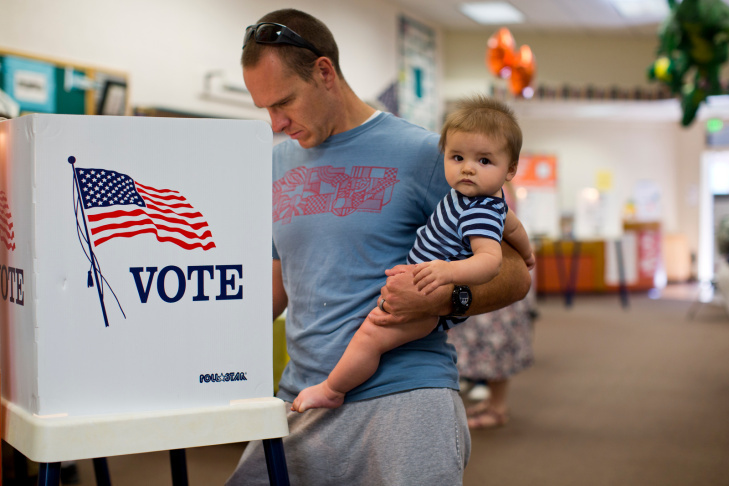 Jeff Thompson holds his 8-month-old son, Tyler, while voting in the Los Angeles County primary election at Canyon Springs School's library on Tuesday evening, June 3 in Santa Clarita. 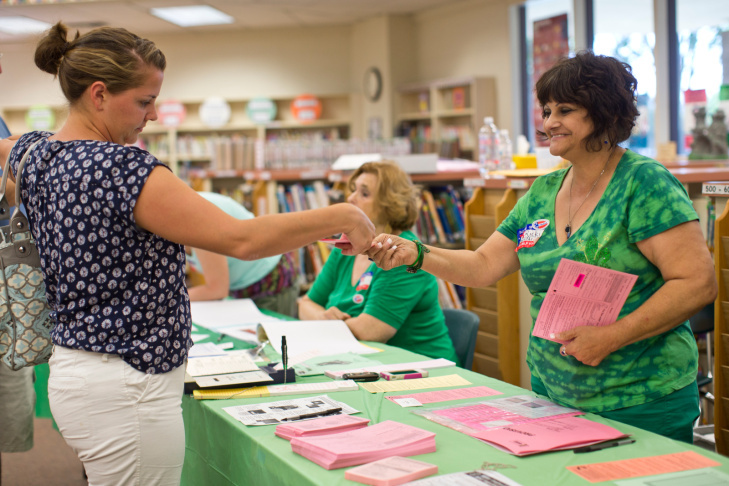 Poll inspector Ricki Ramstad, right, hands a ballot to Lauren Thompson at Canyon Springs School's library on Tuesday evening, June 3 in Santa Clarita. Santa Monica residents cast their votes at the First Methodist Church during the primaries June 3. Ballot boxes alert poll clerks to successful cast ballots at Canyon Springs School's library on Tuesday evening, June 3 in Santa Clarita during Los Angeles County's primary election. Poll clerk Patrick Meacham records voter turnout at Canyon Springs School's library on Tuesday evening, June 3 in Santa Clarita during Los Angeles County's primary election. 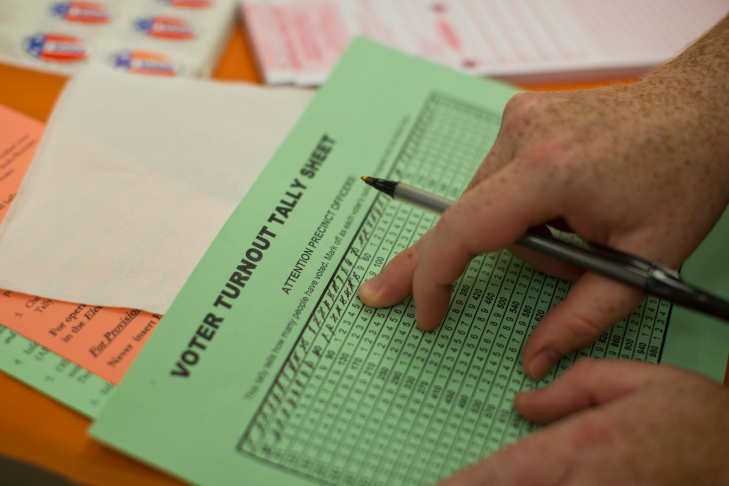 Voting pamphlets are displayed as a voter marks her ballot while voting in California's Primary Election in Sacramento, Calif., Tuesday, June 3, 2014. 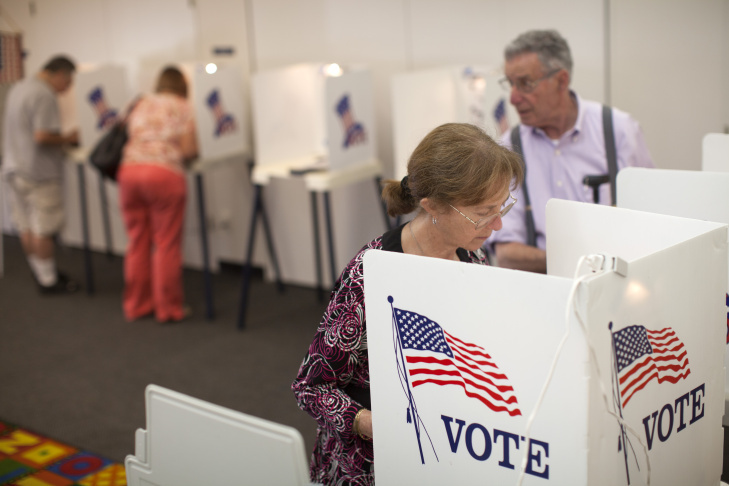 With no divisive ballot initiatives or high-profile races a low voter turnout is expected. Only a week or so ago, the Los Angeles County Registrar-Recorder's Office put out a call for a thousand people to act as paid pollworkers on Election Day. Normally the county needs about 18,000 poll workers to conduct voting at some 5,000 polling places. Lacking sufficient workers, the county went to Plan B, says Elizabeth Knox, spokeswoman for the registrar. They called on county workers for every county office to step up and fill the gaps. The county also put out the word through the network of local city clerks to recruit pollworkers. Knox said the call-out worked and the worker gap was closed. The Los Angeles Times reported that polling places in Sherman Oaks, East L.A., Venice and Malibu were among those that did not open on time. Knox said she knew of about six polling places that did not open by 7 a.m. because a worker or workers did not show up. The county keeps a staff of pollworkers available at a central location to go fill in when that happens, she said. "This happens every election," Knox said. Los Angeles County turnout was approximately 11.41 percent as of 5 p.m., according to L.A. County Registrar-Recorder Dean Logan. Orange County turnout is expected to be around 25 percent by the end of the day, the Orange County Registrar of Voters' Neal Kelley tells KPCC. That includes both in-person and vote-by-mail votes. Voter turnout was at 3.16 percent this afternoon so far, compared to 3.96 percent in 2012 and 4.90 percent in 2010, Kelley said. Vote-by-mail was at 13 percent as of Tuesday. No issues had been reported thus far at Orange County polling places, Kelley said. Turnout was expected to be about 30 percent in Riverside County by the time polls close, interim Riverside County Registrar of Voters Rebecca Spencer tells KPCC. That's similar to other past elections, Spencer said. She said there were no major issues reported. A couple of polling places opened late and that there were a couple of electioneering complaints, Spencer said. 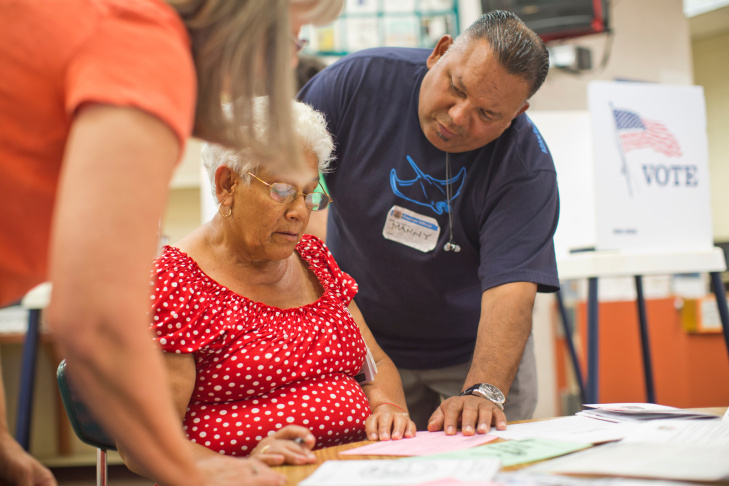 With no divisive initiatives on the ballot Tuesday, the first primary election under California's new top-two system was not drawing much interest from voters despite some fiercely contested seats for Congress, the state Legislature and statewide offices. Two Republicans are vying for the chance to challenge Gov. Jerry Brown in November, with all statewide offices up for grabs, including intra-party fights in the races for secretary of state and superintendent of public instruction. Brown and his wife, Anne Gust Brown, voted in a firehouse near their Oakland hills home Tuesday accompanied by their dog. Brown, 76, said he's got a special opportunity to serve in his unprecedented bid for a fourth term as California governor. "It's been a long journey," he told reporters after casting his ballot. "I have learned a lot, and I hope if the people give me another four years that I can deserve their confidence and trust and lead California in so many different ways." 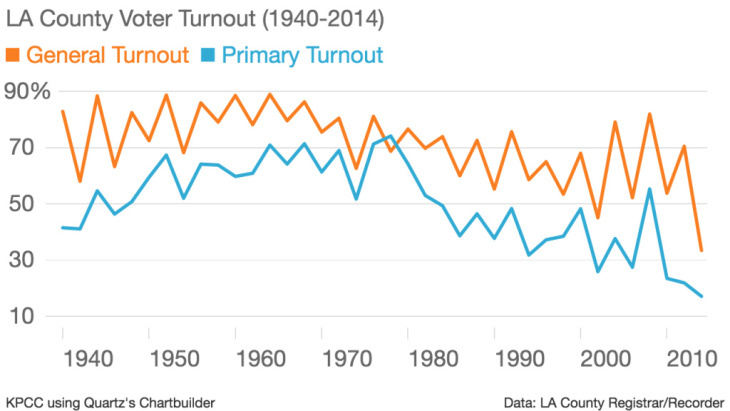 Voter turnout has been trending downward in California primaries over the last 20 years. With 21 percent of voters now unaffiliated with any political party, turnout Tuesday is expected to be very low — perhaps matching the record low of 28.2 percent in 2008, when California split its statewide primary and presidential election contests, said Paul Mitchell, vice president of Political Data Inc., a consulting firm that tracks voter data. Many ballots will be cast by mail at the last minute or dropped off at polling places on Election Day, meaning the outcome in several races could remain up in the air well past election night. Several of KPCC's Facebook followers reported having little to no wait at the polls throughout the morning. "Just got back from my polling place, 11:45am," wrote Christoph Jess. "It was empty and the volunteers seemed happy to have someone walk in. They said people had been 'trickling in all morning' Though I did go between the morning & lunch crowds." One commenter expressed having difficulties at the polls. "I had to go to 2 different polling site before I found my site this morning around 9ish. I didn't want to vote provisionally, felt better to go to where I was listed," Ramon Araujo wrote. 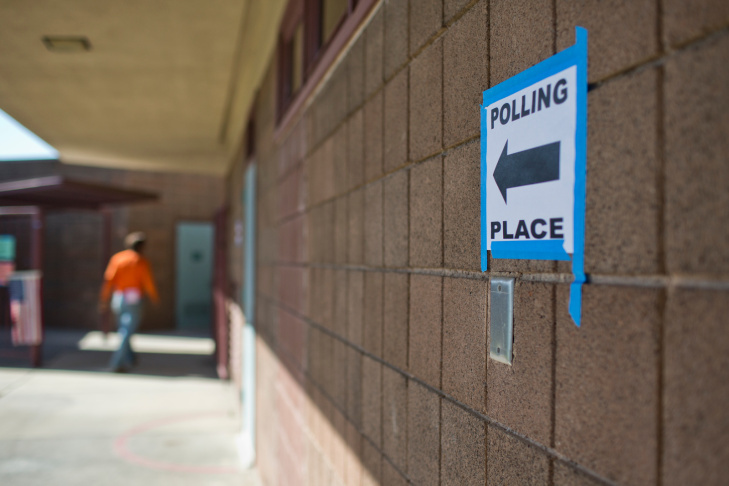 Another commenter saw his empty polling place as a sign of voter apathy. "I voted around 8:40 this morning. There was almost nobody there at my neighborhood polling place. 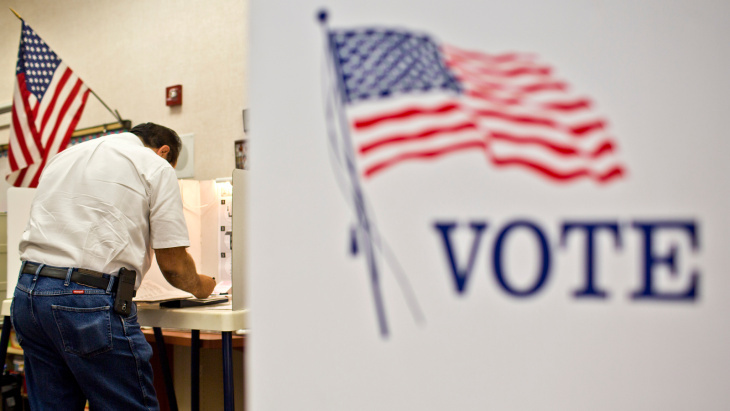 Voter apathy is scary because it tends to let extremists dictate the results," wrote Kenneth Simon. While initial reports suggested a low physical turnout, at least one county in California was expecting above average participation. Sierra County is a mountain community in Northern California where more than half the 3,200 residents vote. County clerk-recorder Heather Foster told KPCC's Take Two the small community is very engaged in voting and suggests a couple reasons why. "We designate all of our precincts as mail-ballot precincts, so everybody votes by mail. I think that certainly has something to do with it," Foster said. "We've been doing that for about 10 years now, so the voters are real used to it. I think another part of it is because we are so small a lot of our local races get a lot of attention." Foster said ballot returns are coming in slower this year, but she still anticipates a total of 65 percent of residents to mark their ballots. Two Republicans have been locked in a close contest to face the Democratic governor. A conservative state lawmaker, Tim Donnelly, faces Neel Kashkari, a socially moderate investment banker making his first run for public office. At an elementary school in Fresno, M.J. Borelli, a 62-year-old Democrat, said Brown earned her vote because he has balanced the state's budget and is familiar with state's water struggles. 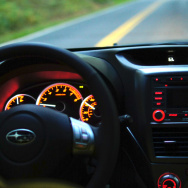 "Jerry's the quintessential guy," Borelli said. "Besides, he's doing a great job." 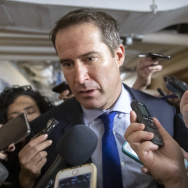 Though Tuesday's ballot has no hot-button initiatives to lure voters, there are a number of hard-fought congressional and state legislative races in which candidates hope to unseat incumbents in the fall. Some are expensive fights in which two members of the same party could advance to the general election in November, such as the nonpartisan contest for superintendent of public instruction, which has drawn $4.2 million in outside spending in a proxy fight between California's teachers unions and their opponents. Incumbent Tom Torlakson faces a fellow Democrat, Marshall Tuck, a former charter school executive. In the race to become California's next elections chief, University of Southern California lecturer Dan Schnur, an independent, faces Democratic Sen. Alex Padilla, Democrat Derek Cressman and Republican Pete Peterson. In the controller's race, former Assembly Speaker John Perez is competing for the top two spots with fellow Democrat and Board of Equalization member Betty Yee and Fresno Mayor Ashley Swearengin, a Republican. 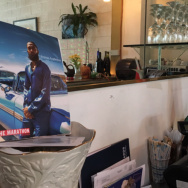 A few seats also are in play in the Legislature, including competitive Democratic contests for Senate and Assembly in the San Francisco Bay Area and in Southern California. In far Northern California, voters will determine whether two counties will join a movement to secede from California, while voters in a third county, Siskiyou, will decide whether to pursue changing the county's name to "Republic of Jefferson." 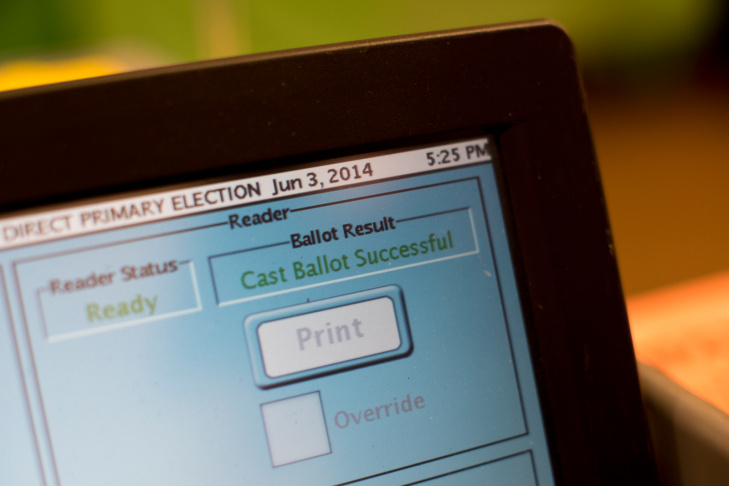 Voters will decide just two statewide propositions, both placed on the ballot by lawmakers. One will require local governments to comply with the state's public records law and pay for doing so, while the other is a $600 million bond for veterans housing. Associated Press writers Terry Chea in Oakland and Scott Smith in Fresno contributed to this report. 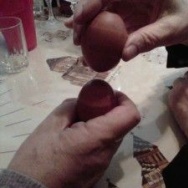 This story has been upated.